Space aliens turning a telescope to Earth might think it’s a static blue ball. We know better. Earth is driven by dynamic cycles. Some are long, as the geologic ones with glaciers that grind rock into dust over centuries. Much shorter weather cycles bring life-giving water. The carbon cycle includes plants that turn carbon dioxide, a gas that animals exhale, into oxygen and the starches and sugars that sustain us. As soil temperature rises above 50 degrees, microbes convert organic matter to nutrients such as nitrate that can either be used by crops or can potentially be lost. Photo courtesy of Iowa Corn. All of these cycles are complex. So is another one that is now, at times, controversial—the nitrogen cycle. More than three-fourths of our atmosphere is nitrogen. Nitrogen is locked into the amino acids, proteins and DNA of all life. But in the air, it’s mostly useless until soil microbes convert it into the forms of nitrogen that plants can take up and use for growth. Mike Castellano, an Iowa State University agronomist and expert on the nitrogen cycle, estimates that a typical soil in Iowa has between 2,000 and 5,000 pounds of microscopic life in every acre. Microbes live in an underground ecosystem of organic matter, which has 100,000 pounds of soil carbon and 10,000 pounds of soil nitrogen per acre. Each acre hosts millions of species of these microbes and they impact nitrogen in the soil. “It’s a lot like the microbes in your gut. It’s diet dependent,” Castellano says. Fortunately, farmers can, and do manage nitrogen with what they put on their fields. 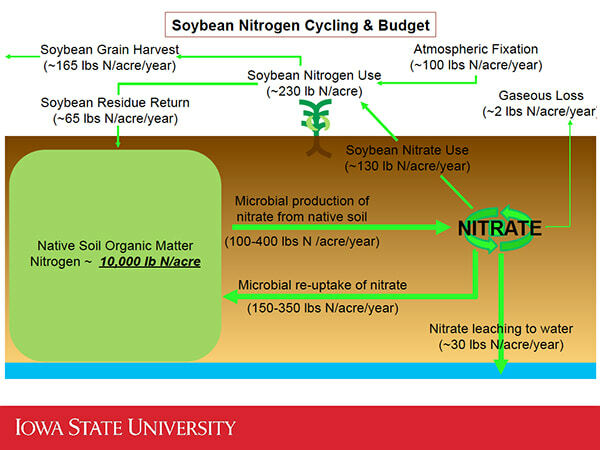 Very little of that 10,000 pounds of nitrogen in an acre of Iowa’s fertile soils is available as nitrate for the crops. Microbes free up 100 to 400 pounds a year as they digest part of the soil organic matter. Microbes also use some of that nitrogen, taking back 150 to 350 pounds each year. Farmers typically add about 165 pounds to each acre as fertilizer for a corn crop. A lot of that variation in native nitrate production and re-use by microbes depends on rainfall and temperatures. In a drought year, the process virtually shuts down. In those rare, extremely wet years like 1993 in Iowa, waterlogged fields favor anaerobic bacteria that convert nitrate back to atmospheric nitrogen. Even in a normal year, about 10 pounds of nitrogen gases per acre escape to the air. Outside of Castellano’s office, it’s a warm day in late March. With soil temperatures above 50 degrees, microbes are already starting to mineralize organic matter in soils. Their own metabolism releases nitrate. “They’re not doing it as a community service,” he says. Fast growing corn and soybeans will use almost every bit of a soil’s available nitrogen, but not for another two months. So the heavy rains that usually arrive in early spring carry the unused nitrate toward groundwater and streams. It’s the mismatch between natural water and nitrogen cycles and the row crop growing season that makes the system leaky. And land use changes over the past 50 plus years have contributed in-part to the mismatch. It’s the result of the mismatch that concerns some. Cover crops, if they’re planted the previous summer or fall, put down roots that will lap up some of the nitrate in the row crop “off-season”. 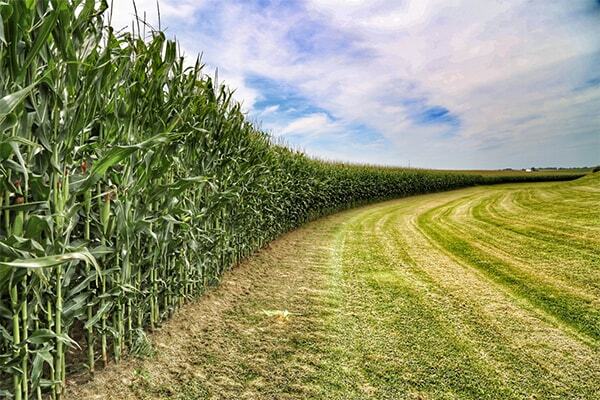 When corn is grown, about 30 pounds of nitrogen (as nitrate) leaches below the plant root zone of an acre each year. There is a misconception that nitrogen fertilizer is largely to blame. But when corn fields are planted the next year to soybean, which get no nitrogen fertilizer, about 30 pounds of nitrates is lost, Castellano says. Because of the timing mismatch between crop use and native nitrate release from soil organic matter, Castellano doesn’t see more precise fertilizer management as a big solution for Iowa’s nitrate management. It is part of the solution. For example, changing the timing or rate of nitrogen application might lower nitrate losses by about 15 percent, he says. Switching from fall to spring preplant nitrogen helps, too, but cuts nitrate loss only about 6 percent and results are highly variable. Fertilizer management is not enough, as the Iowa Nutrient Reduction Strategy calls for a 45 percent reduction. Iowa’s Nutrient Reduction Strategy calls for a statewide drop in nitrogen loss of 45 percent. The strategy offers more than 20 practices farmers can use to approach that goal. A cover crop of rye can reduce nitrate loss by up to 31 percent. Cover crops and changes in fertilizer management are two ways to manage nitrogen in the field. Several edge-of-field practices, such as bioreactors, saturated buffers and wetlands can catch part of what’s missed in the field. Soil is a complex community that ties together those important cycles of water, carbon and nitrogen. Even with scientific understanding that’s still evolving, there’s a lot that farmers can do to raise better crops and minimize the impact on the environment at the same time. See some of the solutions here. “Ultimately, you’re managing microbes when you manage the things we’ve discussed,” says Castellano.